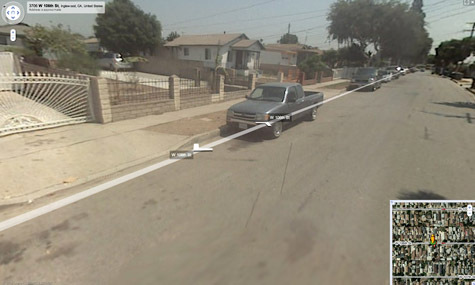 The U.S. Geological Service gives us a Google Maps option for viewing tonight's earthquake reports, but what's extraordinary is that you can zoom all the way down to the urban surface to see that this earthquake actually had an address: it was epicentered at 3706 W. 106th Street. Imagine, though, owning the building centered directly over the earthquake that destroys your whole city... And imagine the weird derived value such a property might hold in the future for disaster enthusiasts. 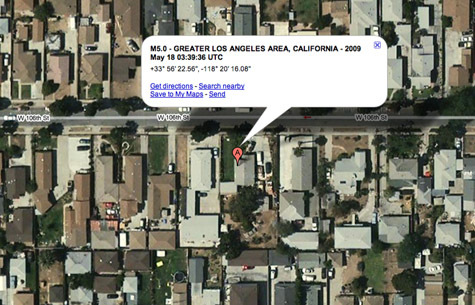 You go to purchase a small house at 3706 W. 106th Street in Los Angeles – only to find that you've been outbid, by several orders of magnitude, approaching $50 million, by an earthquake enthusiast in Japan. He or she has gone around the world purchasing epicenters, strange plots of land in the middle of nowhere that have no apparent use or distinction other than that they figure into the unfolding seismic history of our planet's surface. It's an otherwise unknown subculture that has remained camouflaged within the international property market. Adam: The epicenter is a point, not a zone. It's the location of the center of the shaking. So, for example, if the shaking took place on a straight line, the midpoint of that line would be the epicenter.